The second issue of this beautiful quarterly magazine just arrived in my mail box. I thoroughly reviewed the initial issue here, so this time I’ll just run down my favorite articles. The feature article is an interview with Karen Mahony and Alex Ukolov, the owners of Baba Studio in Prague and the creators of The Alice Tarot (the cover illustration above). I was amazed at how much time and care went into the deck. The cards are not photoshopped collage. Mahony and Ukolov gathered costumes and props and went out on location to photograph each card. Their Tarot de Marseille is scheduled for 2016. I can’t wait. Heather Mendel wrote a very thoughtful article on mindfulness, the suit of swords, and detaching from our mental chatter. Shada McKenzie maintains that the Hierophant is the significator for tarot itself. He’s the intermediary between earthly and spiritual realms, and provides access to higher reality, just as the tarot can do for each of us. Her close reading of the symbols opens up new ways of relating to the card. In the Art and the Reviews sections, I counted at least thirteen stunningly illustrated decks. 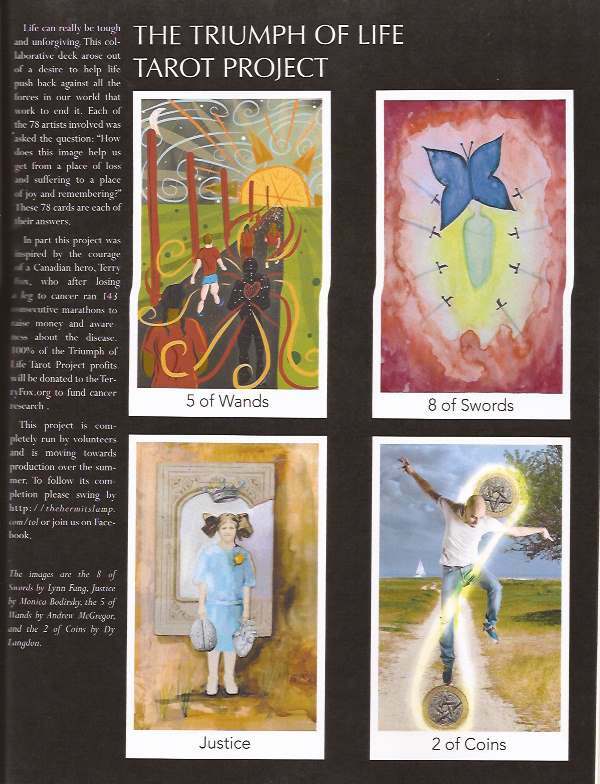 Among them was a preview of The Triumph of Life Tarot (shown here), a collaborative deck organized by Andrew Kyle McGregor at The Hermit’s Lamp. Each card is designed to answer the question: “How does this image help us get from a place of loss and suffering to a place of joy and remembering?” All the profits are going to cancer research. In the Toot Your Own Horn department: The Cartomancer has taken me on as their resident history nerd. In each issue I’ll be writing an article about tarot history and reviewing a historical facsimile deck. This time, I review one of the most attractive versions of the Visconti-Sforza deck in my collection. Then I talk about the historic forces that molded tarot into the structure it’s had since the fifteenth century. The Cartomancer available in print and digital editions. This magazine is simply gorgeous and bound to become a collector’s item. Subscribe or get a single issue here.